This elegant mistletoe card is made from a few simple layers of cardstock. Textured red paper complements the shimmery recessed leaves and raised white berries. The earthy brown card glistens with hints of gold, making it the perfect canvas for this wee mistletoe wreath. Make a brown card that is 5.5" x 4.25". (One sheet of 8.5" x 11" cardstock will make 2 cards.) Set aside. Trace piece #1 onto red cardstock and cut out the square. Trace piece #2 onto green cardstock and cut out the square. Set aside. Transfer the leaf design onto the red square using graphite paper. Place graphite paper on the red square (graphite side down). Place piece #1 on the graphite paper with the design facing up. Make sure all three layers are aligned. Use artist tape to hold the pieces in place. Place the red square on the cutting mat and cut out the mistletoe leaves using an X-Acto. Erase any stray graphite marks. Discard the leaves. Use the tape runner to glue the red square in the center of the green square. Use the one hole punch to cut out 12 white dots. 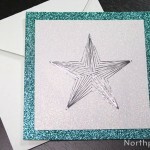 Use tape runner to glue the dots to the card grouped in clusters of three. 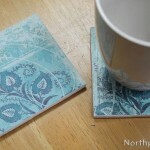 Use the tape runner to glue the squares in the center of the card. Cut a piece of white cardstock that is 5" x 3.75" and glue on the inside of the card. Write your holiday greeting, and your card is complete. This card is a standard card size (A2), and you can find A2 envelopes like these at envelopes.com.